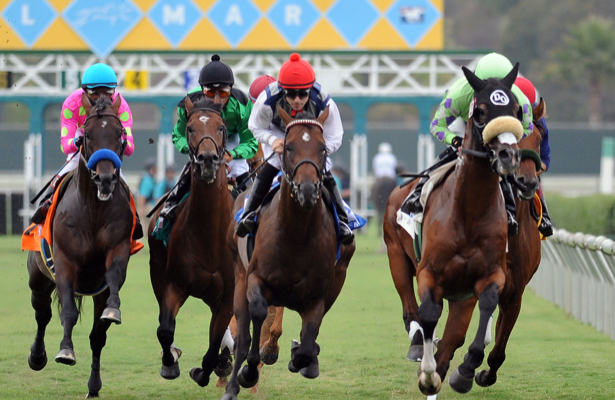 The 16-day Del Mar Fall Racing Festival gets underway on Friday, and the featured race is the Kathryn Crosby Stakes for fillies and mares at a mile on the turf. Let's see if we can hit the ground running and make some money on opening day. #8 Marjorie E (5-2) won back-to-back turf routes at Del Mar over the summer, and she was favored again to win Aug. 30 but was a flat fourth that day. Paddy Gallagher freshened her up, and she might start a new streak under Flavien Prat. #3 Easy Shot (2-1) finished fourth in both local straight maiden starts, and this is his first tagged outing for Team Desormeaux. He could go better today, but his trainer is 0-for-11 with special weight droppers. He does not seem to possess much speed, and he won't offer value. #4 Excellent Sunset (8-1) was right there in all three flat mile turf starts this year. She won as the favorite in an entry level affair at Saratoga Sept. 2, and she missed by a neck as the even money favorite at Keeneland last time. She shows up in the low profile Anna Meah barn, and her first two starters ran okay without winning. #5 Norwegian (8-5) dropped, added blinkers, and finished a clear second as the strong favorite at Santa Anita on Oct. 18. Flavien Prat sticks with the early/pressing filly, and Michael McCarthy shows a profit with his maiden claiming dirt starters.